I also found this alternate small 'C' coptic binding in Smith's Exposed Spine Sewings. It is rather different than other coptic-ish stitches that I have used and I really like it. The cover is made using a page from an old book, and it's a picture of a painting by Claude Lorrain. 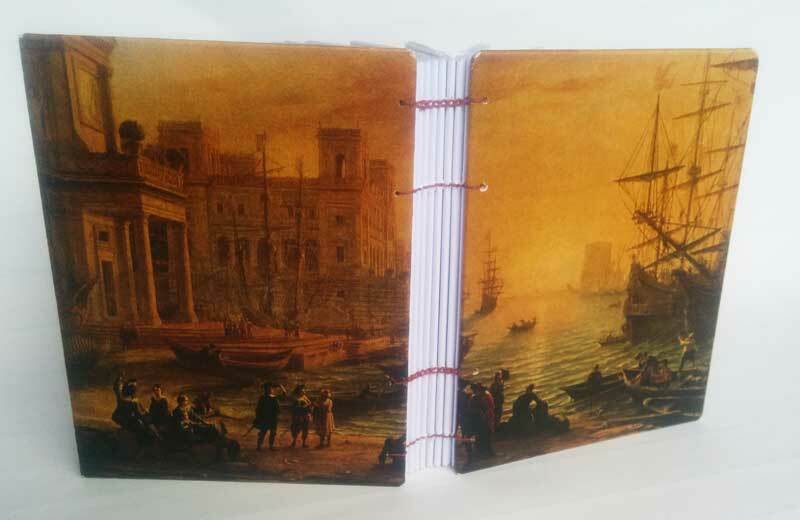 Particularly nice to do this friendly binding following yesterday's torturous book. I'm curious, what's so different about that coptic stitch compared to others? Also, how did you get the pictre from a book to look like that? So beautiful! I love all your bindings! Very inspiring. Thanks Cassienne. This version of the coptic stitch has a different change-over technique. More common ways of doing it use either all chain stitches, or a combination of chain stitches and kettle stitches. This version uses chain stitches and an alternate change-over stitch that is neither a chain nor a kettle. As for the cover picture... I have an old large-format book of prints of famous paintings and the book is falling apart. So I removed this particular print from the book and used it to cover the boards for this journal. Just like I'd use any decorative paper. Simple as that.